The SafetySure® Transfer Slide (SSTS) is a great product for the Parkinson's patient. As muscles become more rigid, patients experience decreased bed mobility. The simple act of turning over becomes a struggle. Placing the Transfer Slide under the buttocks simplifies the turning processes. When used in conjunction with the MTS Transfer Handle® (Item # 2025), the process of getting into and out of bed is easier for both the patient and the caregiver. For early stage patients, the Transfer Slide can help them maintain mobility and the independence they desire. The SafetySure® Transfer Slide (SST Slide) performs a multitude of tasks. Rolling, turning, moving up in bed and transferring from one surface to another. Facilitates easy and smooth transfers due to the slick inner surface of the slide. 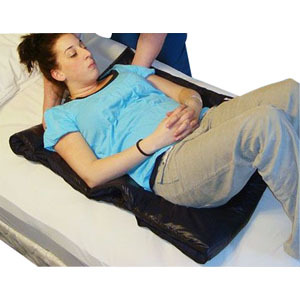 Can be used with SafetySure® Transfer Boards tub seats or transfer benches for independent or assisted patient transfers. Boost a patient up in bed. Turn or adjust patient's position in bed.